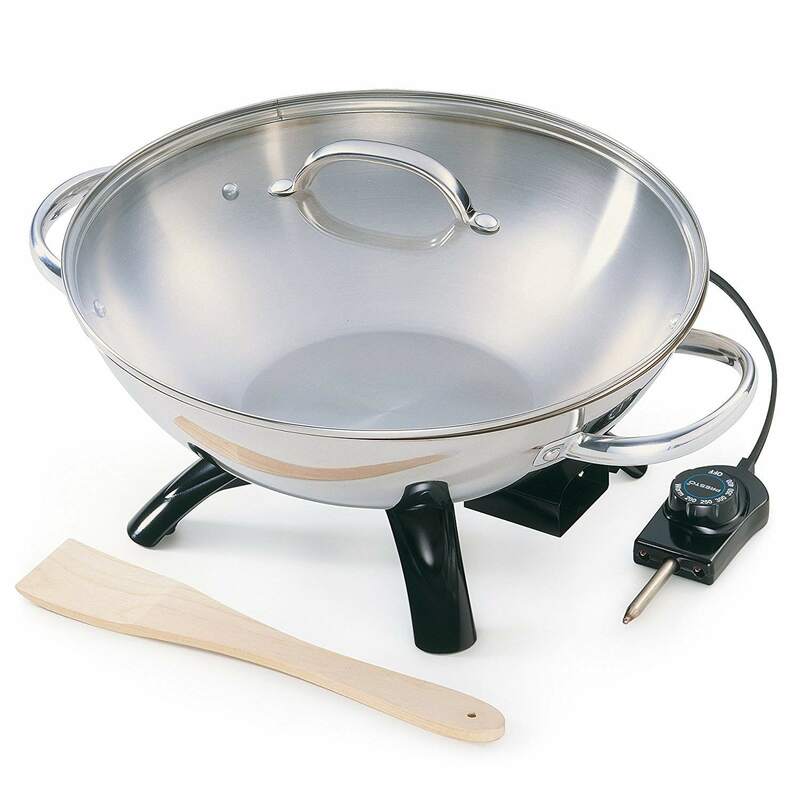 This stainless steel round-bottomed wok features a 1500-watt heating element and an aluminum-clad base for super-fast and even heating. There are side-loop handles that make the pot easy to move and easy to empty when cooking is done. The tempered glass lid has a stainless steel rim and top handle, so you can watch your food while it cooks. While food is more likely to stick to stainless steel than a coated surface, that is less of a problem when using oil in a hot pan and stirring often. The pot and lid are dishwasher safe for easy cleaning. This 6 1/2-quart metal wok has a nonstick cooking surface for less chance of food burning or sticking, and for easy cleaning. The underside of the lid also has a nonstick coating so spattered food will be easy to clean off. However, since the lid isn’t glass, you can’t see the food while it’s steaming or simmering. The handles and base stay cool during cooking, so you can safely move the pot during and after cooking so it’s easy to remove the food after cooking. The temperature control goes from off to high, but it does not show actual temperatures. The wok is not immersible and the pot is not removable, so you’ll need to carefully wash it with a soapy sponge and rinse it without wetting the electronics. This is a serious 6-quart traditionally shaped round-bottomed wok with a 1500-watt heating element that heats quickly to high temperatures. The butterfly-shaped heating element distributes heat up the sides of the pan, similar to cooking on a gas stove with a high-temperature wok burner, while the stay-cool side handles make it easy to move the pot or empty it when cooking is done. The wok is made from die cast aluminum and has a proprietary nonstick cooking surface so food won’t stick and cleanup is easy. The lid is glass, so you can see your food when you’re steaming or simmering with the lid on. This wok’s maximum heat is 425 degrees, but the control dial does not show the actual temperatures. The temperature control probe is removable so you can move the pot without a dangling cord getting in the way. Both the cooking pot and the lid are dishwasher safe. This large round flat-bottomed skillet can work just like a large wok, with a 16-inch diameter cooking surface that can handle a fiesta’s worth of fajitas or a whole lot of stir-fry. It’s made from sturdy stain-proof polished 18/10 stainless steel and has a nonstick interior that prevents food from sticking and makes cleaning easy. When it’s not busy with wok duty, this can be used for other skillet tasks, like frying burgers or cooking pancakes. You can also use it simmer sauces, braise a pot roast, or shallow-fry chicken. The removable temperature probe and side handles make it easy to move the wok with no dangling cord to get in the way. The temperature can be set from keep-warm to 400 degrees. The tempered glass lid lets you keep heat in while allowing you to see how the cooking is progressing. This should be hand washed. If you want to stir-fry occasionally but you want a less-specialized appliance, this electric skillet can do it all. You can stir-fry, just like you can in a wok, while the large 14 x14 inch flat bottom makes the pan work as a standard electric skillet for cooking bacon, burgers, or pancakes, or for simmering sauces or braising stews. This has a ceramic-based nonstick surface that’s easy to clean and releases food easily, while still allowing browning. The pan has a tempered glass lid, so you can see what’s cooking without lifting the lid. The handles are sturdy stainless steel. For even easier cleaning, the skillet is dishwasher safe when the probe is removed.